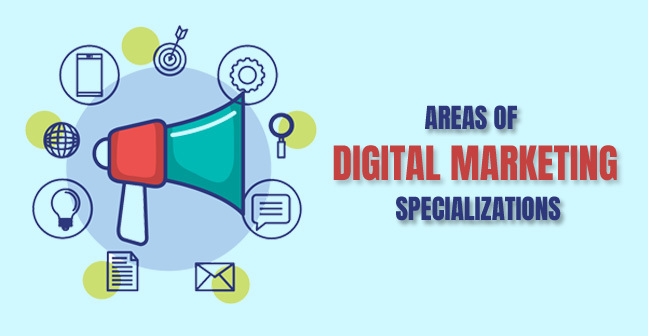 In Today’s Article, we will guide you about different areas of digital marketing specialization. So you searched for digital marketing areas, got to know about so many verticals and now you are confused about where or what, to begin with? We all know that digital marketing is the promotion and marketing through digital mediums and is based on the approach of pull marketing instead of push marketing. Hence, one must have basic knowledge of all the avenues and parts even though you want to choose one area as digital marketing specialization. Unless you do the integrated course in digital marketing where you learn about all the verticals and also work on different tools, you can also do the course in the particular field only as per your requirement. SEO stands for search engine optimization and its basic function is to increase the organic traffic of a website or a particular webpage. An effectively done SEO will rank your page at the top of the search results(SERPs). The result of SEO takes time and requires a lot of research to be done but once your page is ranked, it is difficult for the other competitors to get their way in. SEO result mainly depends upon intent and also the quality of content created matching the intent, no SEO expert can rank garbage or irrelevant content in SERPs in search engines like Google, Yahoo, Bing etc. You would be required to keep an eye constantly to maintain the rank of a webpage and also be in the sync with the updates by the search engine(google). An SEO person requires having some technical knowledge also as this profile deals with the technicalities of a website such as a website architecture, errors & user experience etc. You must have patience as it’s time taking and a quick learner to implement changes and updates. You don’t need to have great communication skills but must have great research and analytical mind. Why choose SEO as Digital Marketing Specialization? There is a lot of demand for SEO services, hence there are many job opportunities. Decent pay at the entry or fresher level and 60-80% hike after a year or two. SEO job profile has a lot of respect as it is not piece of cake. Not easily replaceable meaning once you have acquired a position and handling many projects in any company, no one can dare to take your job. Challenging but interesting as it requires you to think of different ways and solutions to beat your competitors. After a time and experience, you can work freelance as an SEO auditor or strategist. Social Media Marketing is another booming area of Digital Marketing Specialization. Everybody knows about it and is a favorite career among the millennials or anyone who spends his/her day or night on social media. But social media, when used for marketing by the enterprises, is more than what many people think. SMM aims at increasing the traffic to the website and also the consumer engagement. Having a social media presence also increase the credibility of the company. You get to interact with consumers in real time which can be tricky in some situations when you are addressing some user’s concern. You can analyze consumer behavior and target your ideal consumers by studying their activities and create content accordingly. It gives you the flexibility to work from anywhere but you also require to be available 24*7 to keep an eye on consumer’s activity on company’s page and also update posts. Check out the interview of some social media managers, telling what they love and hate about being in this field. Can think out of the box, the more you bring creative solutions the better will be the impact. Why choose SMM as digital Marketing Specialization? You get to handle company’s brand image even at the beginners level. The flexibility of workplace and working hours. Search engine marketing, many people still confuse it with SEO. SEM used to cover SEO and paid search both but over the period, now SEM refers to PPC or paid search only. ‘Search engine marketing (SEM) is a form of Internet marketing that involves the promotion of websites by increasing their visibility in search engine results pages (SERPs) primarily through paid advertising. SEM may incorporate search engine optimization (SEO), which adjusts or rewrites website content and site architecture to achieve a higher ranking in search engine results pages to enhance pay per click (PPC) listings’. It is an expensive method as compared to SEO but gives result immediately. You don’t get to the responsibility to handle paid campaigns of a client, It is a risky job as it involves direct money so you would work under somebody for some time before you get the expertise. You work in a very dynamic field in close contact with the creative team. Why choose SEM as a Digital marketing specialization? Email marketing is simply engaging, retaining and eventually converting the ideal consumers via mail. Even though with the advent of so many platforms, email marketing is still powerful with high ROI. Consistency is required, you would have to pre-plan in advance. A chance to grow your connections with corporate houses. Tricky if you are new and not sure how to do? No matter how good your content is but there will always be the pressure of sales or conversions. Strong language skills and understanding of brevity meaning able to convey the message with least words. Must be aware of lead capturing cycle. Technical knowledge of the tools. Know how to design email for different platforms. Analytical skills can understand reports and figures. Why choose Email marketing as an area of digital marketing specialization? Content marketing aims at creating interest of the user and eventually convert the leads or potential consumers by sharing relevant and useful content with them consistently. There could be various formats of content like e-book, blogs, video, emails, podcast etc. This requires high creativity and out of the box thinking which is fun but also challenging at the same time. Can create Content funnels, therefore, should have the deeper understanding of marketing and target consumers. Need to be good at keyword research, therefore, you cannot sideline the technicalities of SEO and digital marketing; hence creativity or creative writing is not enough. Researching then planning and scheduling the content is done in advanced which gives flexibility. Why choose Content marketing as a Specialization in Digital Marketing? So this was the article to bring you clarity about why and what to choose as an area of digital marketing specialization. we have also shared some cool benefits of digital marketing career, you must check out! This must also have given clarity on what to expect at the beginners level and where are you heading after gaining some experience. Stay tuned for such informatory and insightful posts on digital marketing. How to Improve Quality Score on Google Adwords? What is a Site Map? 20 Phenomenal Tips to Amp Up Your Local SEO. How Can A Local Business Grow Faster Using Digital Marketing? How to Avoid 10 Most Stupid Mistakes That Business Make on Social Media. 5 Startup Marketing Problems & Why Internet Marketing can Solve them? Join the best Digital Marketing Institute in Jaipur to learn, SEO, Social Media Marketing (SMO), Inbound Marketing, Content Marketing, Email Marketing, Video Marketing, Google Adwords (PPC), Blogging, Paid Marketing Methods, Google Analytics, Webmasters etc. Fee is non-refundable and/or non-transferable in any case.